It's hard to believe that EVE Online has been running for a decade. Even more impressively, the game's been growing steadily over the past ten years, picking up refugees from stale fantasy worlds and showing them what the universe has to offer. I've been struggling to find a hopping on point for years. Perhaps September's EVE: The Second Decade Collector’s Edition will do the trick. • Into the Second Decade, a 190-page, richly illustrated hardcover book commemorating the first 10 years of the EVE Universe. Into the Second Decade details the initial release of EVE Online, and chronicles its growth through the game’s numerous free expansions, the community events that helped define the experience, and the launch of DUST 514. • “Rifter” USB hub, a four-port USB hub modeled on an iconic EVE Online ship. • EVE Symphony CD, a live performance of the signature EVE soundtrack by the Icelandic Symphony Orchestra, recorded in Reykjavik during EVE Fanfest 2013. • The Danger Game board game, an English-language adaptation of the popular Icelandic board game. Created by a fledgling CCP in 1998, The Danger Game (Icelandic: Hættuspil) helped fund development of the original EVE Online release. • The “Golden Pod,” an exclusive skin for the iconic capsule (EVE Online). • A “Gnosis” Blueprint, a five-run blueprint of the 10th anniversary Gnosis, the Society of Conscious Thought battlecruiser (EVE Online). • The “Time Capsule,” a selection of collectible items based on classic EVE lore as well as memorable moments over the first decade (EVE Online). • A new skin for the Amarr Magnate frigate (EVE Online). • Powerful weapons and a collection of “Templar” dropsuits for (DUST 514). 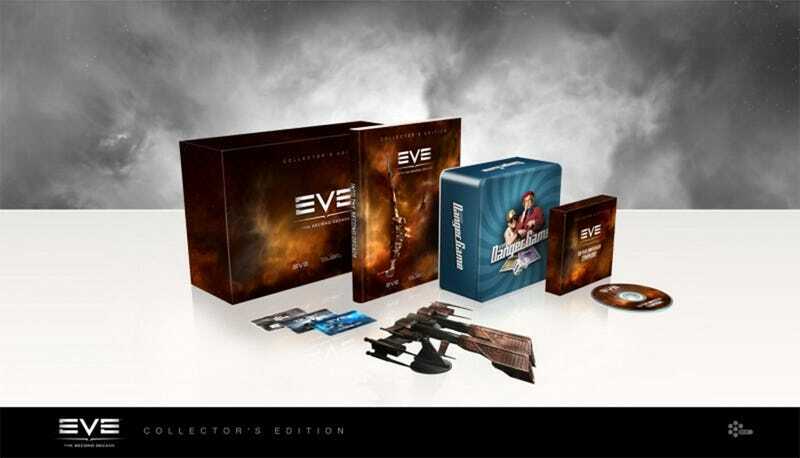 • The box set will also include a “Mystery Code” that will grant owners special, but currently secret, benefits related to future CCP products and events. Fans can preorder the Second Decade Collector's Edition right now. It looks like this fall I'll finally be ready to get my EVE Online on. Now where did I put my skill mapping spreadsheet?